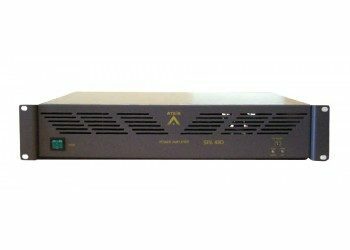 The BPA is a 2RU 19" rack-mountable, 2-channel amplifier, transformer isolated for 100 V, 50 V and 8 Ohm distributed loudspeaker systems.The BPA amplifier has a 230 VAC mains supply input and a 48 VDC battery back-up input which allows it to be used in combination with a battery backup system for maximum availability and reliability in an emergency evacuation system. BPA amplifiers have short-to-ground, short-circuit detection and line-impedance surveillance up to 5% deviation using the DIVA8G2 or IDA8 systems for loudspeaker-line surveillance. They support both single-spure and redundant loop cabling (A/B) and have a switchover facility that automatically reroutes power to a backup amplifier (if present) via the SONAES charger in the event of failure. BPA amplifiers have a rear-panel selector switch for amplifier monitoring according to EN 54-16. 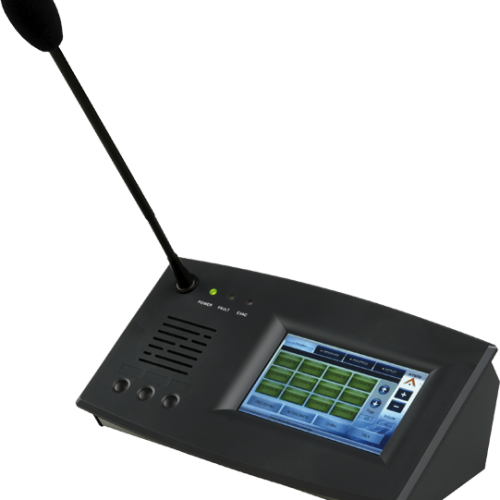 These call stations can have either a dedicated and secured audio and communication link or a non-secured but flexible TCP/IP communication link. 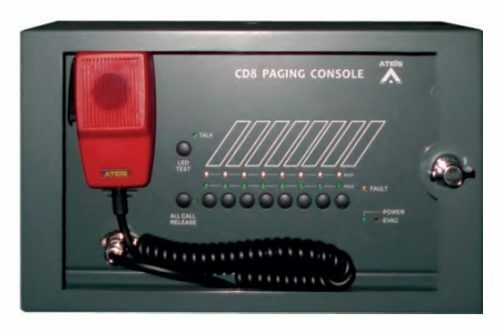 The PSS-G2 paging console is a man-machine interface which allows call-paging, messages broadcasting and DSP matrix parameter control. The PSS-G2 units connect to a secured bus. Its back-lit touch screen is designed for simple and user-friendly operating. The 3-hardware-keys can be freely assigned within the System control software. Various operating levels with password protection make the PSS-G2 a versatile device that fits well in a commercial shopping center as for an industrial high security environment. All paging parameters needed for site operating can be programmed: zones assigned to the different buttons, name of zones, group of zones, messages triggering, levels adjustments and pre-call chime but also for fader control, button control or event control.The message and the chime are stored into the PSS-G2. A total of 168 keys over 12 pages allow zone or group of zones selections. Each key contains a green color changing field indicating that the zone is occupied by a different process. 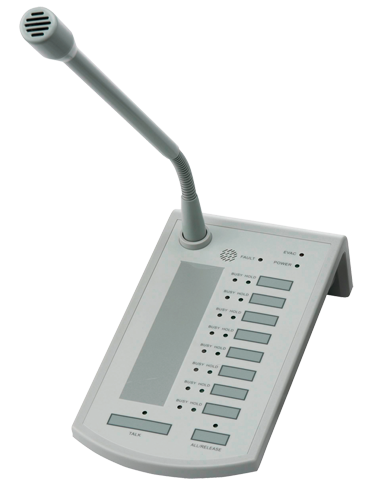 Compatible with UAP and LAP's system units, PPM WJB uses a RS485 protocol over a single CAT5 cable connection, to transport both Audio and Power from the PPM WJB and to the system units.The PPM WJB comprises of 8 zones / 8 buttons with sleek condenser gooseneck microphone, and spring metal protection, providing durability and excellent aesthetics as well as allowing up to 256 zones expansion via the additional Keypad easy extension station. The buttons can represent a single zone or a group of zones and are easily defined via the GUI of the system units using a simple Matrix selection.The unit offers “Hold” and “Busy” LED signals in addition to the zone LED’s, and these allow the easy identification of selection / Busy signals for the user.All buttons can be programmed with drag & drop features from the System unit GUI software and each button can be programmed for Push To Talk or Latch functionality. The unidirectional condenser microphone warrants high quality directive signal pick up from the user and hence less interference from the surroundings thanks to the cardioids polar pick-up pattern.The RS485 communication protocol offers daisy chaining of up to 900 m on a CAT5 cable, and yet makes outlets easy to connect via standard RJ45 connectors. (The microphone compatibility listing shows the maximum number of units per System). DIVA8M responds to public address requirements and Voice Alarm for small to medium installations.The DIVA8M Master unit houses: audio digital signal processing (DSP), a matrix, a digital message player, a fully monitored fireman microphone, amplifiers monitoring with switchover to backup amplifier and loudspeaker lines monitoring. It can process and route one PSSG2 security microphone console or up to eight cascaded PSM paging microphones and two 0 dB audio inputs, plus one Mic/Line input, into 2 different channels (Music + Voice). Each input is fitted with volume controls and equalizers. All audio inputs feature contact and VOX activation (ideal when using the cordless microphone, for example). 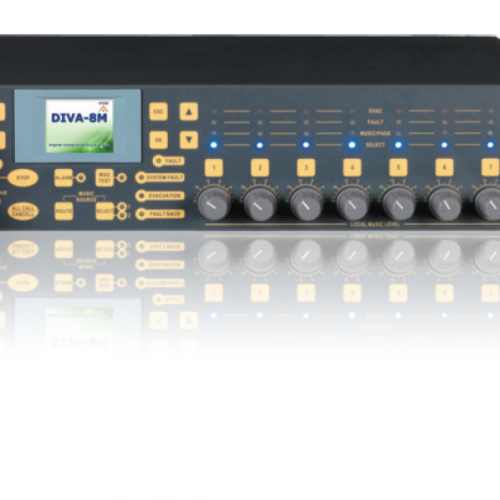 The DIVA8SG2 slave unit is an extension unit for the DIVA8MG2 master controller. It increases the number of paging zones by 8 zones for each slave unit added in the system. Up to 15 slave units can be added per DIVA8G2 system and must be used in conjunction with the DIVA8MG2 master controller. A complete DIVA8G2 system provides up to 128 zones (A/B).The DIVA8SG2 units are linked to the system master via shielded CAT-5 cable(max. length 100m). As a part of the DIVA8 system, The DIVA8SG2 complies with current standards.